Andrew Bonomolo has come a long way since playing an ensemble member in the 2015 Summer Youth Conservatory production of Guys & Dolls. The Northwood High School student has spent his last three summers here, most recently as the eponymous character in last year’s Bye Bye Birdie. As he prepares to transfer to the North Carolina School of the Arts for his senior year, he also prepares to step into the iconic role of Cabaret‘s Emcee. “The Emcee has been portrayed by so many iconic actors, but it was so important to me to build my version of the Emcee from the ground up,” says Bonomolo. “I had to take my personal emotions into account and really explore who my version of the Emcee is.” And as the Master of Ceremonies, he has some big shoes to fill (and in this production, tall ones as well! ), as it is the Emcee who guides the audience through the decedent distractions of the Weimar Republic. “Playing the Emcee comes with the responsibility of doing justice to the themes presented in the show and making sure the audience understands how vital our message is,” says Bonomolo. For him, the biggest challenge is to shepherd the political through-line of the show along, without allowing the heaviness of pre-Nazi Germany to weigh on the audience too much. It’s its own sort of tightrope walk to ensure the audience gets swept up in the delights of the Kit Kat Club without losing the important themes of the piece. 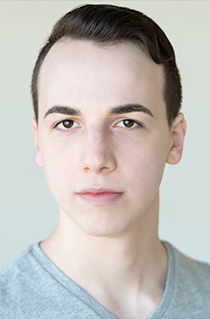 You can catch Andrew in the Summer Youth Conservatory production of Cabaret, onstage at PlayMakers July 18–29. Due to subject matter and adult situations, we recommend parents use more discretion than usual when deciding whether or not their children should attend. For more information and tickets, click here.